It&#146;s hard to imagine why anyone would want to remake Franklin J. Schaffner&#146;s fringe classic Planet of the Apes, and seeing Tim Burton&#146;s half-baked version doesn&#146;t clear the question up. Schaffner&#146;s movie has held a surprisingly durable grip on the popular imagination since its 1968 release, thanks largely to some campy dialogue and a surprise ending that, in &#146;60s parlance, &#147;did the heads&#148; of a generation of 10-year olds. But whatever sting lies in the story&#146;s basic irony&#151;a world turned upside-down in which apes are the master of men, and treat them with the same disdain and casual cruelty that we treat animals&#151;couldn&#146;t penetrate the movie&#146;s primitive style. Burton can&#146;t find the meat in this material either. In Edward Scissorhands and his two Batman movies, he treated his material not as drama but as high pop fable. This freed him from the demands of characterization and narrative, but left him gasping as he tried to compensate for his undernourished scripts with an overwrought visual style. The script of Planet of the Apes is more than undernourished, though&#151;this one&#146;s suffering from rickets. Burton tries to strike sparks off the Jews&#146; flight from Egypt and the American civil rights movement, but the movie is a surprisingly convictionless work that rushes through its running-time despite the evident effort put into it. Where the first Planet took its sweet time in introducing the apes, this one can&#146;t wait to get them into the story. In the year 2029, U.S. Air Force Captain Leo Davidson (Mark Wahlberg) disobeys orders and leaves the space station where he works in order to save a chimpanzee whose space pod has run headlong into an electromagnetic storm. The same storm dumps Leo&#146;s pod onto a planet that conveniently resembles Earth, and he&#146;s barely pulled himself from the jungle lagoon that his pod has sunk in before he&#146;s caught in the middle of a slave hunt. A small army of armed, agile, and highly intelligent apes&#151;mostly a mix of chimps and gorillas&#151;are leading a mad dash after some primitive, nearly naked humans. Before you can say &#147;Act II,&#148; Leo and his fellow slaves are being hustled into a fairy-tale city&#151;a mountain-sized birthday cake surrounded by a spiral of candles&#151;that the apes call home. It&#146;s around this point that the movie should open up&#151;should start to become about something. 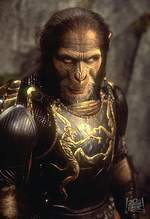 Instead we&#146;re given a mishmash of scenes involving a variety of characters: the human Karubi (Kris Kristofferson, himself looking like a Silverback gorilla); his daughter Daena (the blandly beautiful model Estella Warren); the merciless chimp General Thade (Tim Roth) and his aide, Attar (Michael Clarke-Duncan); Ari (Helena Bonham Carter), the senator&#146;s daughter whose enlightened ideas put her at odds with society; and Limbo (Paul Giamatti), the dollar-fixated slave-trader. Leo sulks in his cage, is forced to play waiter at a dinner party for some upper-class apes, and is brutalized in various ways. With Ari&#146;s aid, he and Daena escape from their cell and head towards the high desert where Leo expects his space station to pick him up. But the location happens to be the spot held sacred by the apes as the place of their genesis. With Thade&#146;s army closing in, the escapees arrive at the rendezvous spot only to find Fate&#151;and Time&#151;playing nasty tricks on man and ape alike. The art of storytelling usually eludes Burton&#146;s grasp, but he&#146;s really groping here. He whips Planet along like a pack-mule, without nurturing any of the opportunities it presents to him. The interspecies jealousy that arises between Ari and Daena doesn&#146;t even reach the level of subplot, and the movie takes up and drops characters like Karubi without our ever understanding their purpose. The torch-lit parade of Thade&#146;s army taking off in pursuit of the futuristic Moses begins as if it&#146;s going to be a grand martial set-piece, but then sputters out in a string of unfocused images. We&#146;re told that the apes live in mortal fear of being drowned, but when Ari must cross a river while clinging to Leo&#146;s back, Burton cuts away from the scene almost as soon as the couple hits the water. Leo&#146;s pep talk to the tribe of humans that joins him in the desert may be the least rousing oration in the history of cinema, and the humans themselves&#151;a colorless horde of extras milling directionlessly about in the sand&#151;are the worst touch in a movie overflowing with bad ones. Disappointingly, the apes&#146; physical movements aren&#146;t developed on the level that their makeup is: when they vault onto their horses, or fly through the jungle after their human prey, we&#146;re aware of the trampolines and catapults sitting just outside the frame. Burton lets the energy seep away from his film at critical moments, and the last half of Planet is smothered under Danny Elfman&#146;s nagging blend of portentous swelling tones and jungle-rhythm percussion. (The movie doesn&#146;t think to include any genuine whimsy, such as the type of music that apes might enjoy.) Planet of the Apes is cheesy but it isn&#146;t much fun, and it never reaches the level of pulp poetry. Even the picture&#146;s most moving moment&#151;a wounded primate crawls away from a battlefield to die alone&#151;is undercut by a later (and unnecessary) development. It isn&#146;t a total washout, though. The masks that Rick Baker&#146;s makeup team has crafted for the various apes are a wonder to behold, moving with every inch of the actors&#146; faces so that they can express the smallest flickers of emotion. A piece of set-design near the movie&#146;s end pays unobtrusive homage to the Statue of Liberty&#146;s spiky crown that presided over the original&#146;s ending, and this may be the movie that puts the phrase monkey ex machina into widespread usage. But Tim Roth is the best reason to see this Planet: the conviction with which he plays the virulently bigoted General Thade is almost loony in its intensity. The strategy sessions between Thade and the giant Attar, punctuated with involuntary snarls and growls emerging from their dormant animal natures, have a comic freshness the rest of the movie could sorely use. Burton and his screenwriters never make a convincing case why such cornball material should be revisited. They make no attempt to create an original social structure for the planet&#146;s unlikely masters, settling instead for making the apes&#146; world a scarcely distorted version of our own. Planet is populated by some fatally familiar stereotypes, such as the deal-cutting senator and his trophy wife, or a street gang clad in black leather jackets. Worse yet, these apes speak in a series of cultural in-jokes comprehensible only to modern Americans&#151;they talk for our benefit, not their own. The trophy wife frets over her &#147;bad hair day,&#148; and even Barry Goldwater&#146;s most famous quote is jammed into General Thade&#146;s mouth with a slight revision. The apes are soon arguing over a &#147;separate but equal&#148; doctrine for the humans, and at one point the cravenly slave-trader echoes Rodney King&#146;s &#147;Can&#146;t we all just get along?&#148; line, stammer and all. Planet&#146;s simpleminded plea for brotherhood is a poor substitute for the vision Burton could have lavished on his world, and it extends to a perfunctory epilogue that inverts the original Planet&#146;s ending. It won&#146;t be surprising if Burton takes some flak for his movie&#146;s constant conflation of primate rights with the black civil rights movement, and it&#146;s a confusion that would be offensive if it didn&#146;t feel so naive. But Burton himself seems to be jumping backwards in Time: the Peter Pan Complex that&#146;s locked him in a state of arrested adolescence for so long is starting to look like incurable infantilism. The man can hardly be held accountable for what he&#146;s saying, even if his goo-goo-ga-ga&#146;s sound like a plea to give monkeys the vote.